Cortec VpCI-641 liquid is a water-based, rust preventive additive for the protection of ferrous and non-ferrous metals in industrial waters. VpCI-641 is non-toxic, environmentally safe, and does not contain nitrite or phosphate inhibitors. Based on all organic components, VpCI-641 has the ability to protect at extremely low concentration levels. It is safe, economical to use, and easy to dispose of. VpCI-641 contains a combination of contact and vapor phase corrosion inhibitors capable of protecting even partly filled spaces. TYPICAL APPLICATIONS: VpCI-641 is formulated to protect metals from corrosion caused by fresh water. The most typical application is addition of VpCI-641 to water during hydrotesting. In some cases it can be utilized in cooling systems filled with fresh water. For long-term post application protection, please use in combination with VpCI powders. 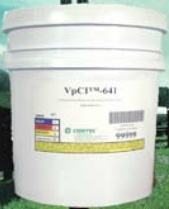 5 Gallon Pail - Cortec Product #13602402 - Shipping Weight: 50 lbs. 55 Gallon Drum - Cortec Product #13602403 - Shipping Weight: 550 lbs.